The P.L.E.A.S.E.® device is the new robust technology which enables the delivery of bio-active agents of large molecular size to dermal layers. The P.L.E.A.S.E.® device creates micro-pores of the desired size and depth almost painlessly. The creation of these channel-like pores happens without any significant trauma allowing the bio-active agent to permeate lateral and downwards into the tissue. The state of the art P.L.E.A.S.E.® Professional device creates precise micropores of about 1/10 mm depth into the skin. Bio-active substances are applied by a Gel or cream. They will be delivered by passive diffusion into the skin through these accurately micropores. The controlled inflammatory response to microporation enables substances to deeply penetrate into the tissue and enhances the absorption of the active ingredients. In a study carried out in Copenhagen to assess the efficacy and safety of ablative fractional laser-assisted daylight photodynamic therapy (AFL-dPDT) for treatment of actinic keratosis in organ transplant recipients, pain was assessed using a numerical rating scale (whereby 0 = no pain and 10 = worst pain imaginable) and long-term skin changes were evaluated. Patients reported minimal pain during treatment with AFL-dPDT ... with no long-term pigmentary changes. At the current laser settings, we find that AFL-dPDT is a safe and efficacious treatment that may be used for larger skin areas. 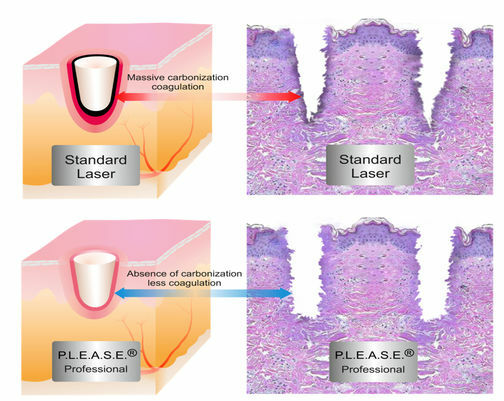 Less carbonization and thus minimal coagulation may not only result in shorter healing times and a significantly lower risk of hypopigmentation, they also create a highly-effective passage for drug delivery. The char-free micropores enable a better uptake of substances, even large molecular size drugs. 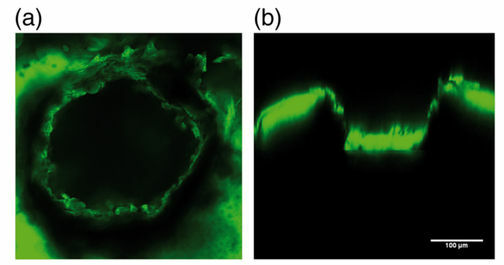 Confocal images showing the distribution of FITC fluorescence in the (left) XY- and (right) XZ-planes following P.L.E.A.S.E® poration of full thickness porcine skin. Both pore density and pore depth may play an important role in immunogen delivery. 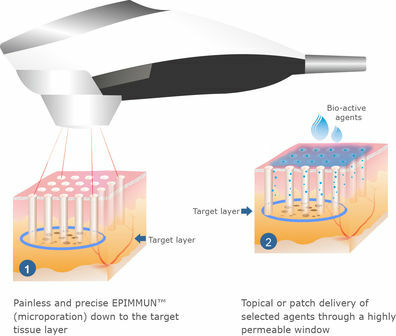 The ability to adjust both parameters via the user-friendly touchscreen allows for controlled delivery of the desired dosage to targeted skin layers. ©Graphic cumulative lidocaine/time: Bachav et al. 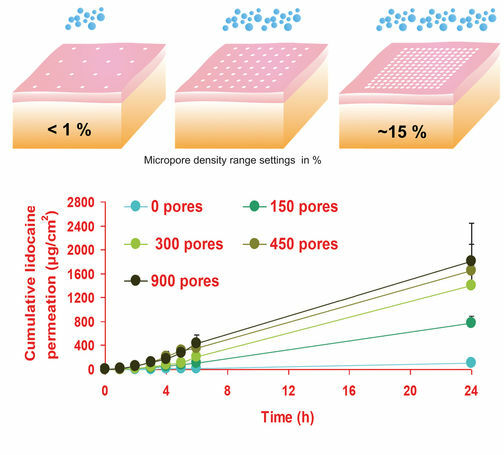 A higher number and therefore higher density of micropores will increase the efficiency of delivery, which can be seen in the cumulative permeation of the drug into the skin.